For his father, see Mark Ingram Sr.
Mark Ingram Jr. (born December 21, 1989) is an American football running back for the New Orleans Saints of the National Football League (NFL). He played college football for the University of Alabama, won the Heisman Trophy, and was a member of a national championship team. The New Orleans Saints chose him in the first round of the 2011 NFL Draft. During his sophomore college season in 2009, Ingram won the first Heisman Trophy ever awarded to an Alabama Crimson Tide player, set the Crimson Tide's single-season rushing record with 1,658 yards, was recognized as a unanimous All-American, and helped lead the Tide to an undefeated 14–0 season and the 2010 BCS National Championship. Ingram was born in Hackensack, New Jersey, the son of former NFL great for the New York Giants, wide receiver Mark Ingram Sr. He attended Grand Blanc Community High School in Grand Blanc, Michigan during his freshman, sophomore and junior years, and then Flint Southwestern Academy in Flint, Michigan for his senior year. He was a four-year starter on his high schools' football teams, running for 2,546 yards and 38 touchdowns in his final two seasons. He was Saginaw Valley MVP, Area Player of the Year, and an All-State selection as a senior. Ingram also played defensively as a cornerback, totaling 84 tackles and eight interceptions his senior year. In addition to football, Ingram also ran track & field while at Flint, where he was nine-time All-State selection. He competed as a sprinter (PR of 10.69 seconds in the 100-meter dash and 21.90 seconds in the 200-meter dash) and long jumper (top-leap of 7.25 meters). Considered a four-star recruit by Rivals.com, Ingram was listed as the No. 17 athlete in the nation in 2008. Ingram received an athletic scholarship to attend the University of Alabama, where he played for coach Nick Saban's Alabama Crimson Tide football team from 2008 to 2010. Ingram played behind Glen Coffee his freshman year, and he was selected to the 2008 SEC All-Freshman Team.He was put on the cover of NCAA Football 12. His team-high 12 touchdowns also set the Alabama freshman school record. In the season opener of the 2009–10 season (Chick-fil-A Kickoff Game: #5 Alabama vs #7 Virginia Tech), Ingram was the player of the game with 150 rushing yards, a rushing touchdown, and a receiving touchdown. On October 17, 2009, in a game against South Carolina, Ingram ran for a career-high 246 yards. He was named SEC Offensive Player of the Week. In the 2009 SEC Championship Game versus the undefeated and top-ranked Florida Gators, Ingram rushed for 113 yards and three touchdowns, while also catching two passes for 76 receiving yards to combine for 189 all-purpose yards. In the game, Ingram also surpassed Bobby Humphrey's single-season rushing record for the Crimson Tide, reaching 1,542 rushing yards for the season. On December 12, Ingram won the Heisman Trophy in the closest vote in the award's 75-year history. Ingram was Alabama's first Heisman winner, the third consecutive sophomore to win the award, and the first running back to win the award since Reggie Bush. At the time Ingram was nine days shy of his twentieth birthday, making him the youngest player to win the Heisman. Ingram was recognized as a unanimous first-team All-American, having received first-team honors from the Associated Press, American Football Coaches Association, Football Writers Association of America, Sporting News, and Walter Camp Football Foundation. On January 7, 2010 Alabama defeated Texas 37–21 to win the BCS National Championship. Ingram received honors as Offensive MVP after rushing for 116 yards and 2 touchdowns on 22 carries. For the 2009 season, Ingram rushed for 1,658 yards and 17 touchdowns. He also had 334 receiving yards with 3 touchdowns. Ingram was ruled out for the season opener after undergoing minor knee surgery the week prior to the opening game against San Jose State. Sophomore running back Trent Richardson filled in for Ingram for the first two games, after it was announced that the junior was not likely to play against Penn State on September 11. He eventually made his season debut in a road game against Duke, rushing for 151 yards on nine carries, including two touchdowns in the first quarter, as Alabama routed the Blue Devils 62–13. After a 3–0 start, Alabama traveled to Fayetteville to face the Arkansas Razorbacks in the conference opener for the Crimson Tide. Ingram and the Alabama offense came back from a 20–7 third quarter deficit to take a 24–20 lead with just over three minutes remaining, when Ingram capped a short, 12-yard drive with a one-yard touchdown run. Ingram finished with 157 yards on 21 attempts and two touchdowns. He did not break 100 yards again during the regular season. On October 9, Alabama suffered their first loss since the 2009 Sugar Bowl when the team fell 35–21 to South Carolina in Williams-Brice Stadium. Ingram was held to a season-low 41 yards on 11 carries in the loss. Ingram finished his junior season with 875 yards on 158 carries with 13 touchdowns, with an additional 282 yards receiving and a touchdown. On January 6, 2011, Ingram announced he would forgo his senior season and enter the 2011 NFL Draft. At the time of the announcement, he was projected as a first round pick. The New Orleans Saints selected Ingram with the 28th pick in the 2011 NFL Draft—the same pick number the Giants used to draft his father, Mark Ingram Sr., twenty-four years earlier. Ingram was the first running back drafted in 2011; since the 1970 AFL-NFL merger, this was the latest pick used for the first running back chosen in an NFL draft. The Saints acquired the pick from the New England Patriots, trading their second-round selection (#56 overall) and their first-round selection in 2012 to do so. As Alabama head coach Nick Saban is part of Patriots head coach Bill Belichick's coaching tree, the Patriots were widely assumed to be interested in drafting Ingram themselves. On July 28, 2011, Ingram decided on the number #28 in honor of his and his father's draft pick number. The next day Ingram agreed with the Saints on a four-year contract, with three years guaranteed and a fifth year option. The contract is worth $7.41 million, with a $3.89 million signing bonus. On August 12, 2011, Ingram scored his first touchdown as a Saint on a 14-yard run in a preseason game against the San Francisco 49ers. On September 25, Ingram scored his first touchdown in regular season play as a Saint on a tough 13-yard run against the Houston Texans. On October 23, late in the game on Sunday night in a runaway win against the Indianapolis Colts Ingram injured his heel. It was considered a 'day-to-day' injury at first, but Ingram was unable to practice the entire week and missed the following game versus the winless St. Louis Rams which ended in a 31-21 loss for the Saints. After wearing the 28 jersey for two seasons, Ingram changed to number 22, the number he wore at Alabama, before the beginning of the 2013 season. .
On March 7, 2015, Ingram and the Saints agreed to a four-year deal. On November 15, Ingram injured his shoulder in the week 10 matchup against the Washington Redskins. Ingram and the Saints would end up losing the game 47 to 14. In Week 12 of the 2016 season, Ingram ran for 146 yards on 14 attempts and a touchdown along with one catch for 21 yards for a touchdown in a 49-21 win against the Los Angeles Rams, earning him NFC Offensive Player of the Week. ↑ "2008 SEC Football All-Freshman Team Announced". SEC Sports News. 2008-12-11. ↑ Russo, Ralph (2009-12-12). "Ingram delivers Alabama its first Heisman". Yahoo! Sports. ↑ Matuszewski, Erik (December 9, 2012). "Texas A&M's 'Johnny Football' Is First Freshman Heisman Winner". Bloomberg News. Retrieved 2012-12-09. ↑ "2009 Associated Press All-America Team". CBSSports.com. ↑ "2009 AFCA FBS Coaches' All-America Team". AFCA.com. 2009-12-03. ↑ "Alabama defeats Texas, rolls to first national title since 1992". ESPN.com. ESPN. Associated Press. 2010-01-07. Retrieved 2010-05-28. 1 2 University of Alabama Department of Intercollegiate Athletics. "2009–10 Overall Individual Statistics". RollTide.com. Retrieved January 8, 2011. ↑ Low, Chris (2010-08-31). "Alabama's Mark Ingram out for opener". ESPN. Retrieved 2010-12-04. ↑ "Mark Ingram back running, still doubtful". ESPN. 2010-09-09. Retrieved 2010-12-04. ↑ "Alabama rolls as Mark Ingram runs for 151 yards, 2 TDs in season debut". ESPN. 2010-09-18. Retrieved 2010-12-04. ↑ "Mark Ingram TD completes rally as Ryan Mallett INTs doom Arkansas". ESPN. 2010-09-25. Retrieved 2010-12-04. ↑ "Alabama Crimson Tide vs. Arkansas Razorbacks – Box Score". ESPN. 2010-09-25. Retrieved 2010-12-04. 1 2 "Mark Ingram stats". ESPN. Retrieved 2010-12-04. ↑ "Stephen Garcia tosses 3 TDs to help South Carolina upset Alabama". ESPN. 2010-10-09. Retrieved 2010-12-04. 1 2 Kausler, Don Jr. (January 7, 2011). "Tide's Marcell Dareus, Mark Ingram, Julio Jones announce they are going pro". The Birmingham News. Retrieved January 7, 2011. ↑ University of Alabama Department of Intercollegiate Athletics. "2008–09 Overall Individual Statistics". RollTide.com. Retrieved January 8, 2011. ↑ University of Alabama Department of Intercollegiate Athletics. "2010–11 Overall Individual Statistics". RollTide.com. Retrieved January 8, 2011. 1 2 Duncan, Jeff (April 29, 2011). "New Orleans Saints hit daily double with Mark Ingram, Cameron Jordan". The Times-Picayune. New Orleans. Retrieved April 29, 2011. ↑ Kaberon, Eli (February 22, 2012). "Running backs losing their first-round luster". Pro Football Weekly. Retrieved 2012-09-04. ↑ Reiss, Mike (April 19, 2011). "Source: Patriots to host Mark Ingram". ESPN.com. Retrieved April 29, 2011. 1 2 "Mark Ingram agrees to deal with Saints". ESPN.com. ESPN.com news services. July 30, 2011. Retrieved August 28, 2011. ↑ Mike, Triplett (July 30, 2011). "Details are in on Mark Ingram's contract with New Orleans Saints". The Times-Picayune. New Orleans. Retrieved August 28, 2011. ↑ Andrew, Boyd (August 13, 2011). "New Orleans Saints' Mark Ingram talks about his first NFL TD". The Times-Picayune. New Orleans. Retrieved August 28, 2011. 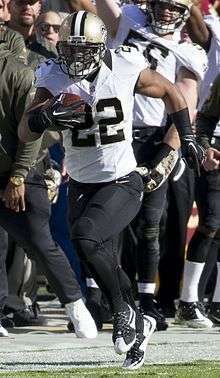 ↑ "Drew Brees picks up Saints in 4th twice as Texans falter late". ESPN. September 25, 2011. Retrieved October 30, 2014. ↑ "Drew Brees nearly flawless as Saints pick apart unarmed Colts". ESPN. October 24, 2011. Retrieved October 30, 2014. ↑ "Rams upset Saints as Steven Jackson runs for 159, 2 TDs". ESPN. October 30, 2011. Retrieved October 30, 2014. 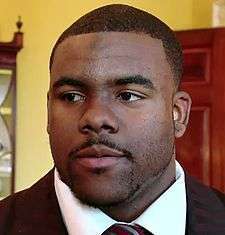 ↑ "Heisman Trophy winner and former Alabama star Mark Ingram is wearing a new number". al.com. March 19, 2013. Retrieved December 10, 2014. ↑ "Drew Brees leads Saints' blowout of Packers as Aaron Rodgers falters". ESPN. October 26, 2014. Retrieved October 26, 2014. ↑ "Saints down Panthers, end seven-game road losing streak". ESPN. October 30, 2014. Retrieved October 30, 2014. ↑ "Mark Ingram staying with Saints". ESPN. March 7, 2015. Retrieved March 7, 2015. ↑ Ortega, Mark E. (November 30, 2016). "Ingram, Mack among NFL Players of the Week". NFL.com.